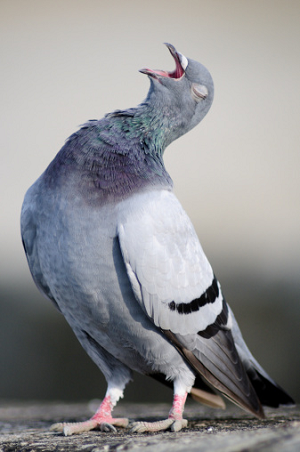 Observe the behaviour of a bird, a pigeon, say. It appears to be in constant appraisal of itself in awareness of perceived circumstances. Every move it makes appears directed to self-preservation; it aims to avoid injury, fleeing from what is realised as a threat - a threat to its life, the observer would remark. The ‘threat to its life’ appears so substantial a realisation as to compel a reaction of avoidance or flight, but in actual fact is without a definite concept of ‘life’; only that the approaching form itself is an image of threat - and that, only when it is near enough to pose a threat – that compels a reaction in a specific response. Being ‘physically threatened' appears to hold within it the instinctive fear of ‘threat to its life’. The animal reaction to ‘a threat to its life’ that has no image except the form of the threat, is but the converse to the movement of life appetites that compel acts of recourse to fulfil these. The animal, even at the level of man, cannot understand why it is so compelled to act, given that 'life' is the abstraction pulling the strings. Appetitive objects are partaken of in specific actions of recourse; just as in the act of flight from danger to its life, a specific action is initiated on no precise image of ‘its life’ except in the image of physical threat. In basic terms, an animal is said to have an instinct for 'life', which would explain why it flees from a threat posed. The compelling instinct for life is evident in the animal’s internally generated motions of life appetites. The sustained motion of internal organs, such as heart-beat and lung expansion and contraction, not to mention the functioning of stomach, liver and kidneys, bowels, and control centres in the brain, are even more mysteriously in affection of sustaining the animal’s life, for they are quite evidently involuntary; this pseudo-subject affection for 'life' is even apparent at cell level, which cells indeed are termed ‘living’, that, together in harmony, in all their variety of form and function, work for the life of the body, expressing itself in the body’s appetitive affections for ‘life’, as yet a metaphysical concept, that appears as a subject function of the body in an exterior context of forms. The human observer takes for granted that a pigeon will flee a source of danger in preservation of its life, much as he would. He would also understand that a threat to life constitutes more specifically a threat to the body’s well-being in a given circumstances. For example, I watch my step when I am walking, because I anticipate the consequences of a fall as makes it realised as harmful; though not quite the notion of danger to ‘life’. Crossing a road with care, however, is accompanied by the realisation that a car colliding into me would be ‘potentially fatal’, though the specific consequences imaginable would be crippling injuries; the threat to ‘my life’ is in respect of the unimaginable, yet, which is the basis of threat. Falling into a deep river from a bridge would likewise cause me to ‘drown’; which sensation of drowning is not so much anticipated as the fear of ‘losing my life’, ‘life’ being defined, though indefinable. The threat to its life for the pigeon, as it is for a human being, is an abstraction which is realised as a specific physical threat to its body, which perceived, it is compelled to avoid by responses that are realised conceptually in an instant as ‘that to do’. Generally, we see that behind all our compulsions driven by appetite, from rising in the morning to preparing a meal, to driving safely, to working and playing, and to retiring at night, is the instinct for preservation of life, the ultimate goal that is an abstraction. It leads to that sometimes voiced question,‘What’s it all about?’ – simply because we have no idea what life is as something aspired to, but feel only the compulsion to live, whereby life is realised in the living of it. Living is identified with life: rather is it the case that life is always a metaphysical concept aspired to, that mysteriously draws all our internal processes, of which our subject is the extension in the external world, manifested in what we call living. The affection for life as a metaphysical concept is suitably fleshed out in evident reasons for living, made manifest in a particular course of action, or career, a calendar of events, holidays, or lifestyle. If one can develop a rhythm of making life worthwhile in events, as the west seems to have a talent for in its sporting and cultural events, in anticipation and enactment of which, then in preserving the memory of, it comes to be definitive of what life is all about. In the living are desired experiences, and the experiences of pain that must be avoided at all costs. Life is identified in terms of experiences of the body or ecstasies of the mind – basically, in the living. Death is seen as the termination of life – mysterious because we have no knowledge of life in the concept of it, except as in the living. Identifying life with the sensation of living is rather let down by habits or lifestyles that are destructive of health, thus, of life, as in smoking, drinking, eating to excess, unsafe sexual practice, drug addiction, compulsive gambling etc. People who engage in these activities do not analyse their behaviour in terms of how the concept of life that so drives their appetites to preservation of the life of the body, here accomplishes the opposite: no, but they do feel a compulsive urge nonetheless that directs the actions to realise the experiences that eventually come to define what ‘life means’ to them, or define its otherwise ‘lack of meaning’. The identification of life, as a metaphysical concept, with the experience of living is clearly shown up as mistaken. Life is an abstraction that is yet urgently compelling of appetites without it being understood. One cannot then identify it in the living, as though confining it to its physical effects. However, we can identify it as a metaphysical principle that, since the body is a complex structure, as are other forms of life, such as cells or plants, compels the structuring process of living things. Further, life as a metaphysical principle structures the non-living things of which life forms are structured, since you cannot build a house without bricks. Life is formative of the most basic structures in the universe. Thanks for an engaging,intellectually satisfying read.Regards.